Research Shows How Strong Merchandising with Used Cars Gives You an Edge - Cox Automotive Inc. 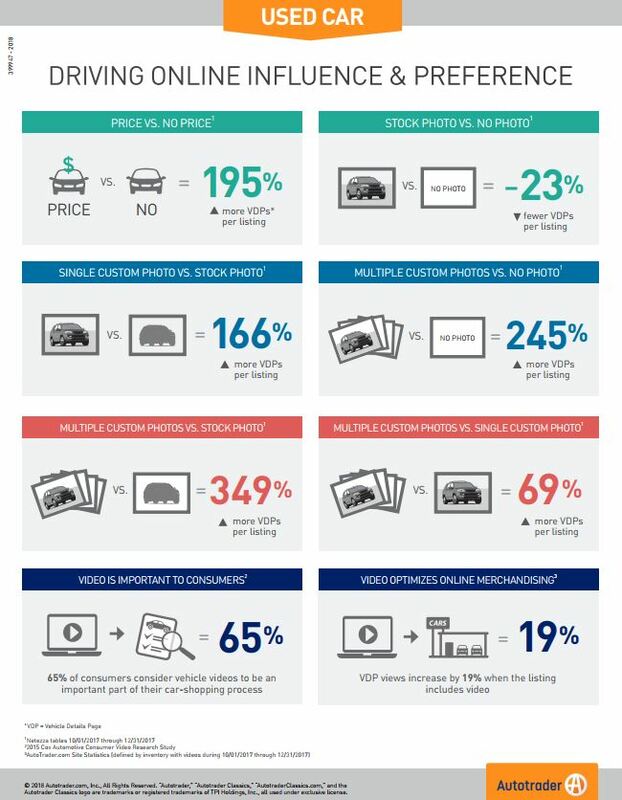 This infographic shares key insights on the effectiveness of providing pricing in your listings, custom photos vs. stock photos and vehicle video to drive influence and preference for your used car inventory. Regardless of whether you’re a franchise or an independent dealer, you can set yourself apart from your competition, and drive influence and preference with strong merchandising. In fact, because data shows that shoppers are more likely to engage with well-merchandised vehicles,1 Autotrader’s search results are now not only based on shopper search criteria, previous shopping behavior, price and distance of vehicle to the shopper, but also on merchandising. Dealers can ensure their used cars rank higher on the SRP by making sure they are well-merchandised with quality photos, video, vehicle details, custom comments, and pricing. Take a look at the numbers. See the infographic to understand the used-car merchandising tactics that drive influence & preference online for your inventory online.